I am a great fan of Firefox browser but I feel little disappointed with their recent policy about increasing the frequency of browser updates. They have reduced the time interval between two Firefox releases and that forced me to adjust to my customization. I use the browsers in my own customized way but whenever I update the current installation, I lose the customization. However, it always looks for new updates and forces me to install the latest release. So I have disabled the automatic check for latest release by Firefox on my computer. You may see a window like below to alert you the recent release. Since its an automatic check, it can appear at any time on your screen. I no longer see this alert on my computer because I disabled it. In case if you want to do the same, follow the instructions below. Now uncheck automatic update check for Firefox. On the contrary to what I expressed here, some users enjoy the frequent browser updates. They consider it a good way to fix any possible vulnerabilities in the past versions. Such a user will find it awkward if the browser is not detecting the latest release. If you are such a user and the Mozilla browser installed on your laptop is not automatically checking the new versions, you can fix this issue by following the instructions below. Go to Update and check the boxes near automatic check for updates. 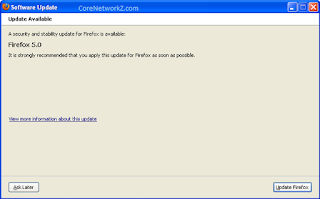 It is not good to keep the feature auto update check for a longer period of time unless you are manually verifying the status of your current Mozilla Firefox browser status on your device. Keeping an older outdated version of the web browser on your PC itself is a great security vulnerability. Its because hackers already know the bugs in older versions and it will give them the advantage to gain access to your PC. Best practice is to ensure all the software installations on your computer is up to date. Here is a list of interesting tutorials for you.